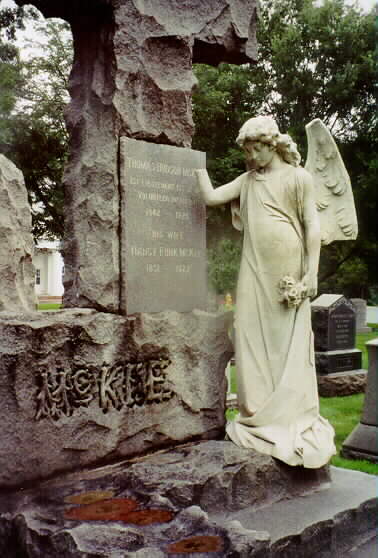 Thomas Hudson McKee served in the 1st West Virginia Volunteer Infantry and was an aide to Brigadier General Benjamin Franklin Kelley. General Kelley is buried just to the rear of Lieutenant McKee's gravesite in Section 1 of Arlington National Cemetery. 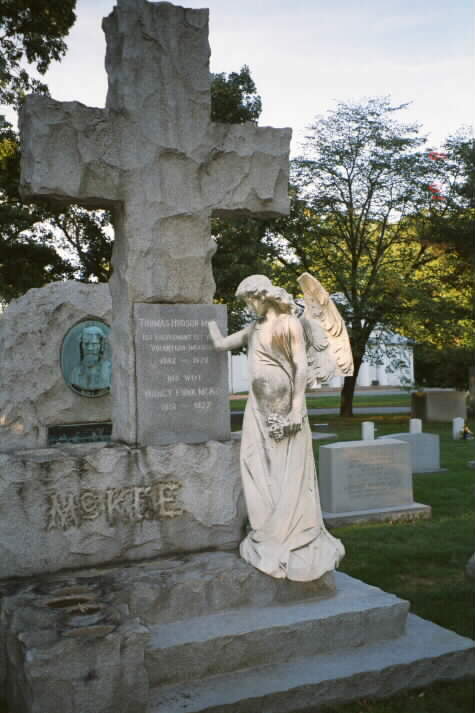 It is rumored that when he died in 1924 his wife, Nancy Matilda Funk McKee, built a large memorial to the Lieutenant in order to "block the view" of General Kelley. 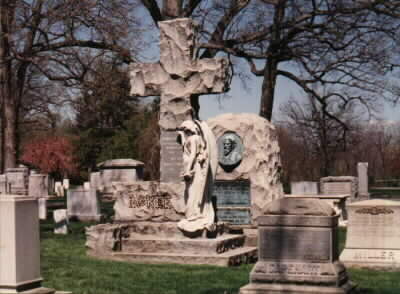 His wife (1851-1927) is buried with him. Wells, James M. (Capt., 8th Michigan Cav. ), With Touch of Elbow; or Death Before Dishonor, John C. Winston Co.: Philadelphia, etc., 1909, pp. 134-161. Libby Prison, Richmond, Virginia. Still the head needed protection as well as the feet, and, in passing out among my sleeping comrades, I stumbled upon a hat which later proved to be the property of Lieutenant Thomas H. McKee, of the 1st West Virginia Regiment, who nightly shared the luxuries of the floor with me in that immediate neighborhood. Without compunction or unnecessary ceremony, I placed the hat where it would do the most good for the present, and proceeded on my way, afterward learning, to my regret, that McKee was sick that night, and in consequence unable to participate in the escape. What will serve as a sequel to the story of the hat and boots will appear later on. Condition: PB. 1st ed. VG- in wraps 8vo 11pp Memorial Day speech by this veteran of the G.A.R. Title: "Biography of Thomas Jefferson, Historical Notes, and Inaugural Addresses"
McKee, Thomas H.; "The Text of Loyalty in the State of Virginia in 1861." In War Papers (MOLLUS, DC, Paper 90). 10 p. (10 photocopied pages). E464M5.1991v45. McKee, Thomas Hudson. A Manual of Congressional Practice (The U.S. Red Book). Washington, DC: Thomas H. McKee & Co., 1891. 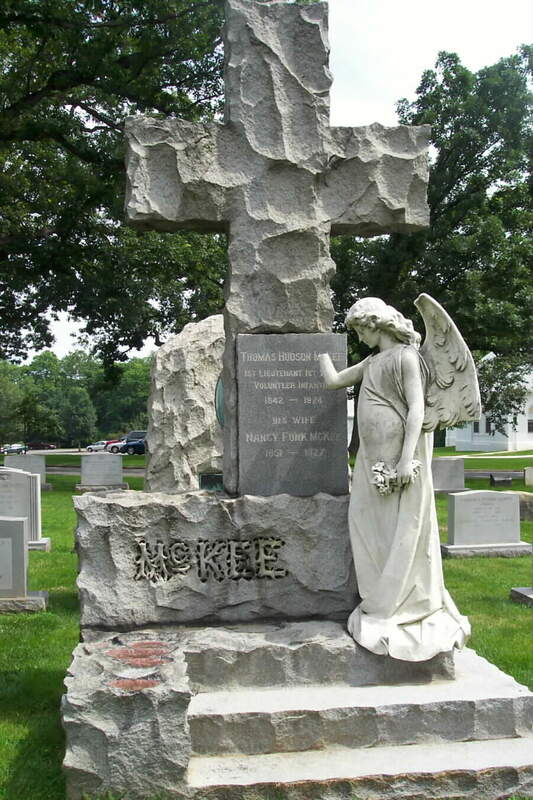 McKEE, THOMAS H. - Age, 19; Height, 5 7"; Complexion, fair; Eyes, blue; Hair, auburn; Birthplace, Washington County, Pennsylvania; Occupation, farmer; Date of Enlistment, 12 September 1861; Place of Enlistment, Independence, Pennsylvania; Rank, First Lieutenant. Remarks: Promoted from First Sergeant to Second Lieutenant, 1 November 1862. Captured by the enemy at Moorefield, West Virginia, 11 September 1863. 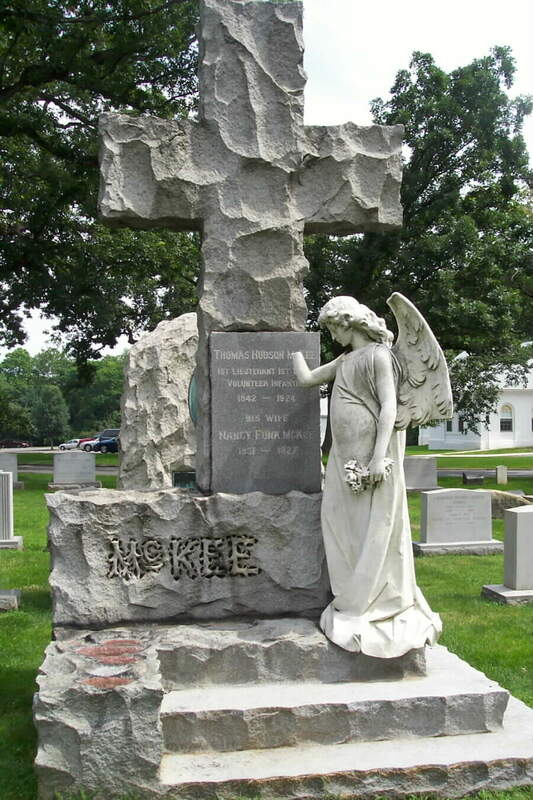 Nancy (great-granddaughter of Lieutenant McKee) told me that there is a grave next to the McKees in Arlington. It is that of their daughter, Molly. When Molly died she was divorced and did not quality to be buried in Arlington. Thomas McKee was a friend of the then President Teddy Roosevelt. He asked the president for special permission and was granted a presidential approval to bury Molly in the family plot. Nancy's father, who was also Thomas Hudson McKee, was reared by his grandfather and grandmother in Washington D.C.
Nancy's father, who was also Thomas Hudson McKee, was reared by his grandfather and grandmother in Washington D. C.
Nancy's father died about 11 years ago but Nancy has related many stories to me of his youth, playing with one of the Roosevelt children in a goat cart, etc.. Her father was also a dear friend on Sarah T. Hughes, who swore in LBJ at the death of John Kennedy. 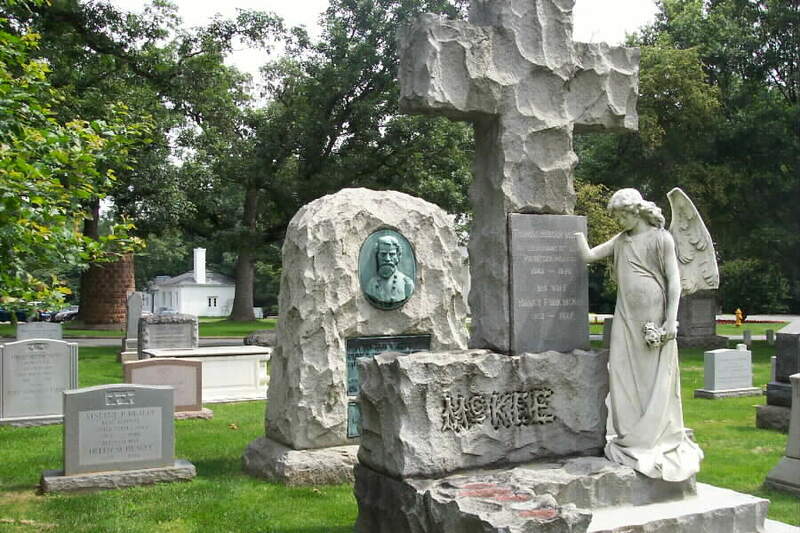 The monument with the large cross and the female figure is that of Lieutenant McKee. The monument for his former commander, Major General Benjamin Franklin Kelley, is directly behind McKee's and has a sculpture of the General on its front.